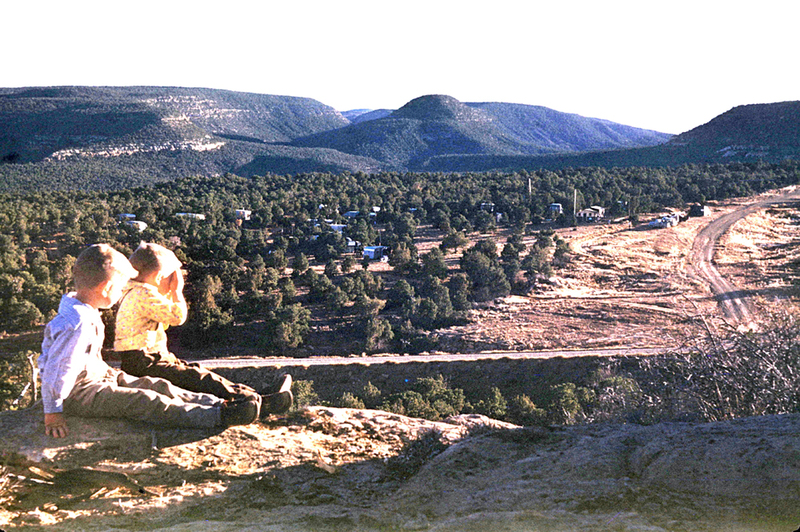 George Simmons is a professional geologist and worked for the US Geological Survey begining in the 1950s. 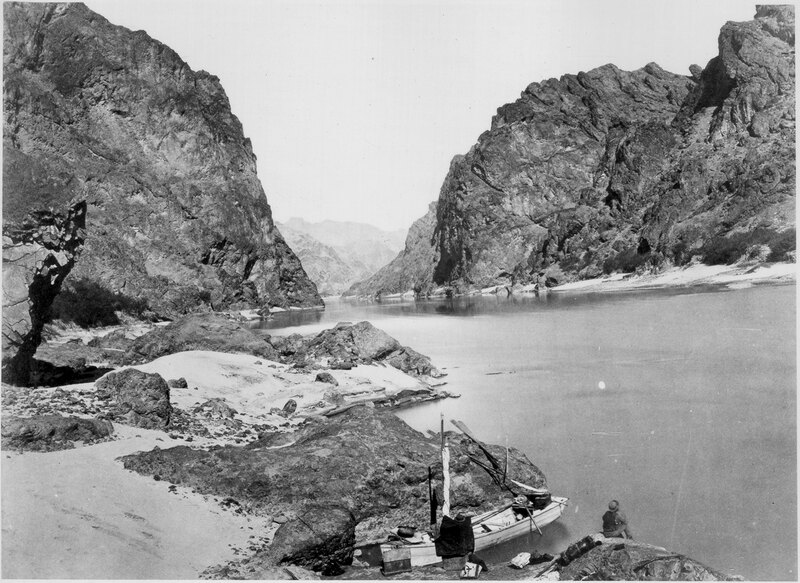 He was also a founding member of the Powell Society and created a river guide of the Colorado River in Grand Canyon. 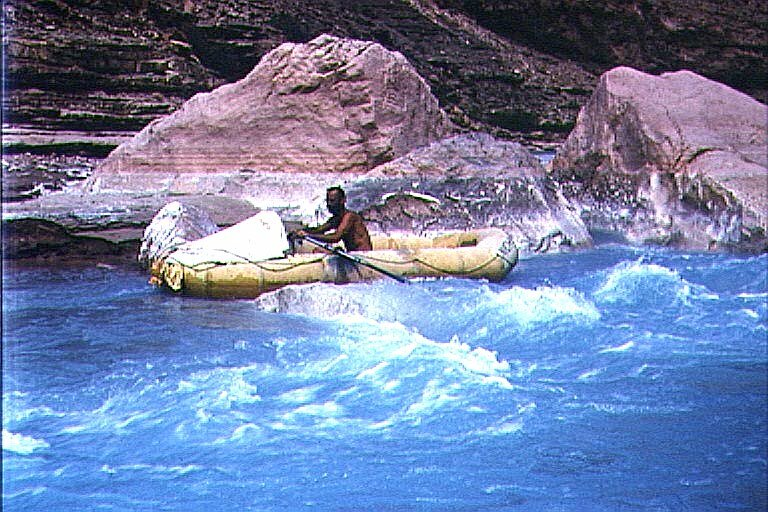 George was an enthuasiastic instructor on many interpretive river trips for the community of professional river guides that work in the Upper Basin of the Colorado River. 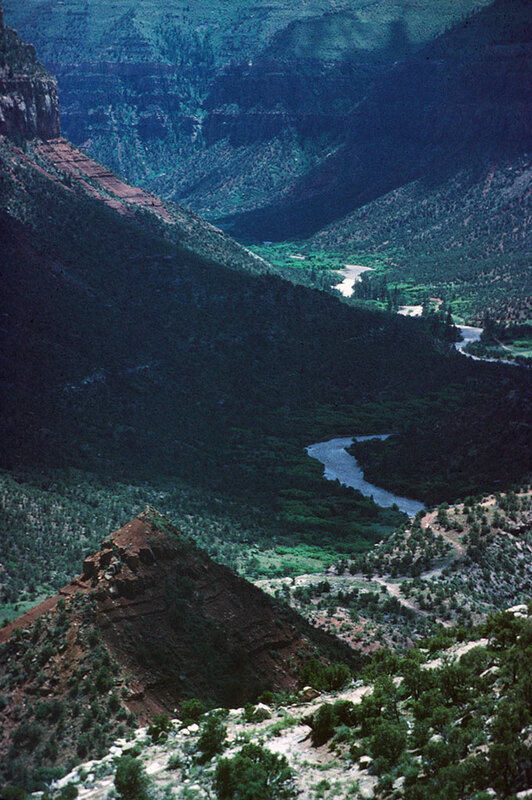 Figure 1 - Dolores River and its canyon. 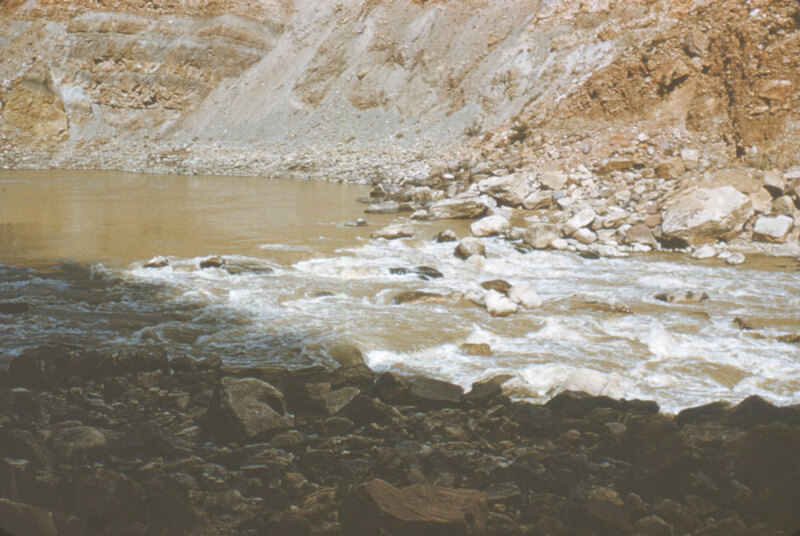 View upstream from the rim above the Mucho Grande Mine (Sec. 1, T. 42 N., R. 18 W.), Slick Rock District, Colorado. 26 May, 1973. 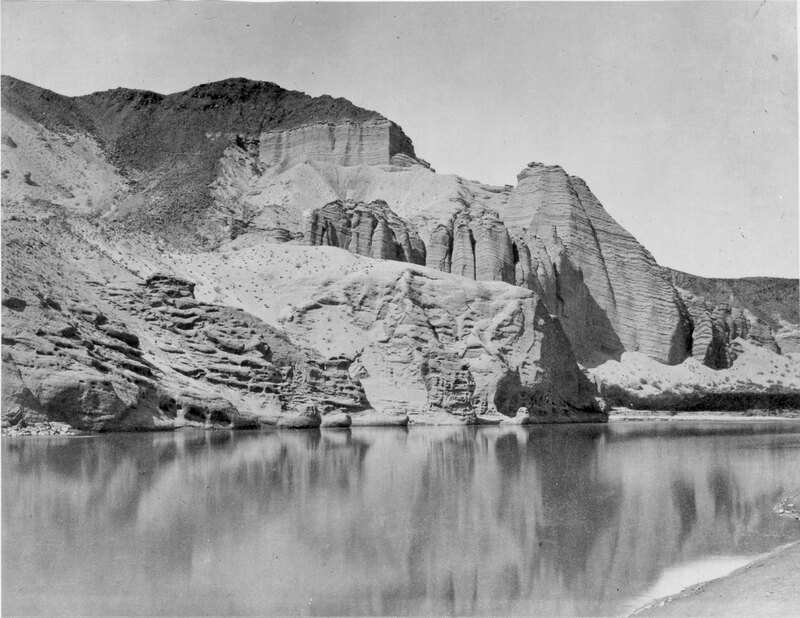 Figure 2 - Canyon of the Dolores River below the Dove Creek pumping station. government employees exploring for uranium. November 1954. 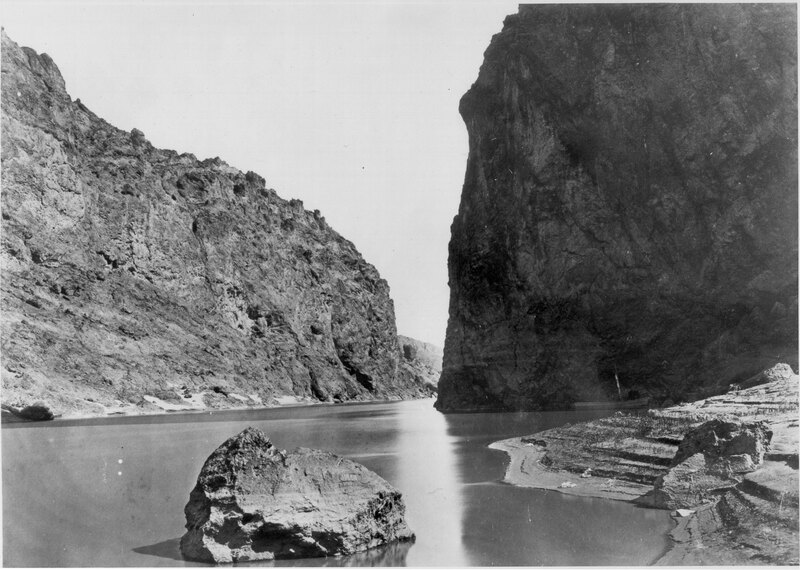 The camp was located along Colorado Highway 80, now paved and designated Colorado 141, 3 miles from the Dolores River toward Egnar (that's Range spelled backwards). Fiqure 4 - Slick Rock (town) circa 1956. 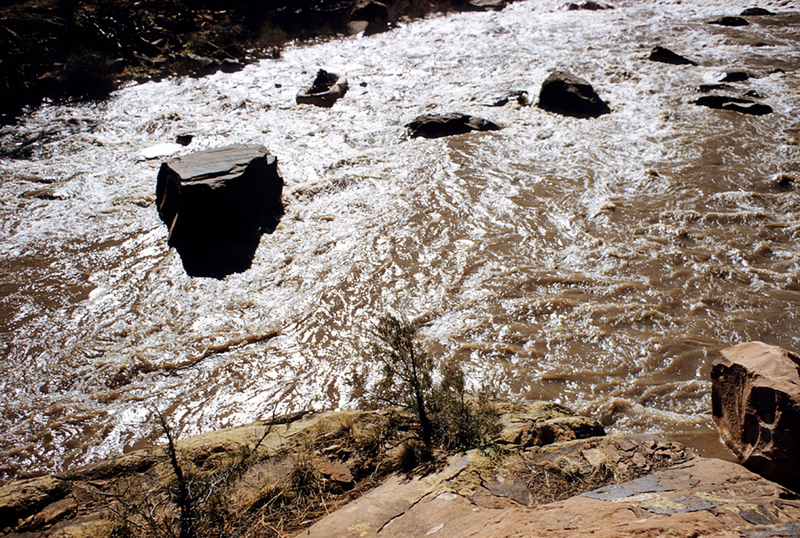 Located at Dolores River Mile 48.5, one mile downstream from Colorado State Highway Bridge. 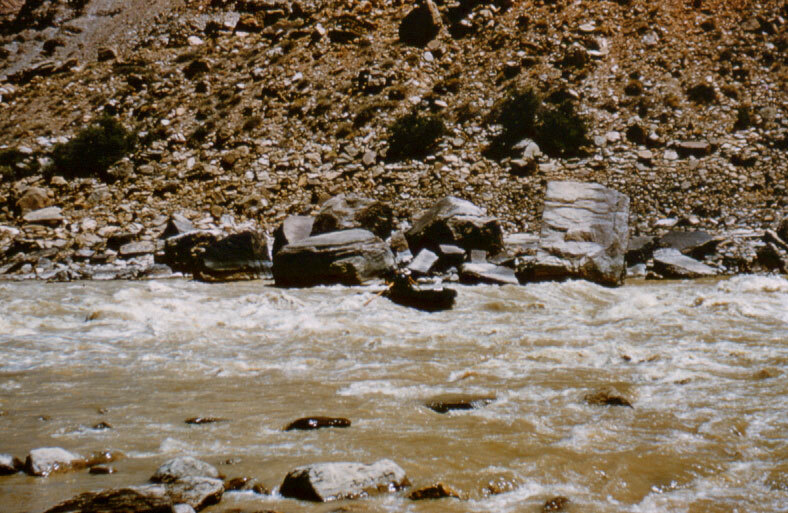 River flows from left to right across view. 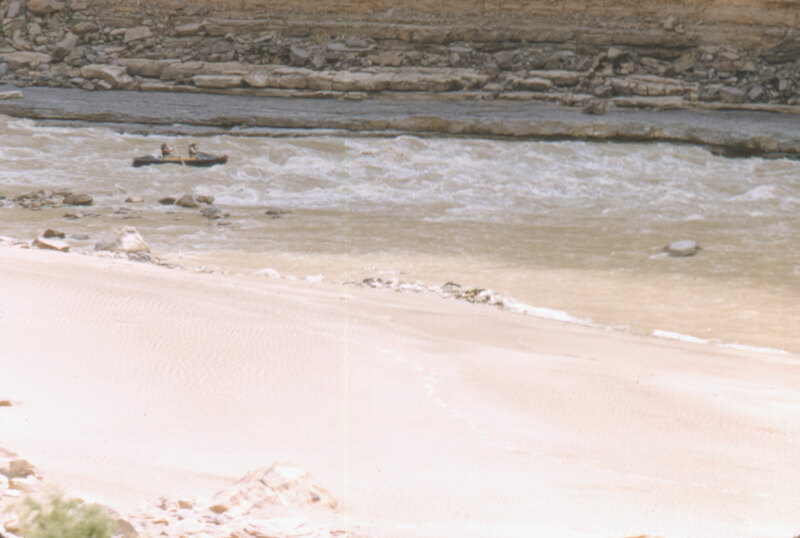 Figure 5 - Bob Gant with The Waters of Lodore and Nicholas Needlefoot at Big Canyon Rapid the ingress point by the Dove Creek Pumping Station Mile 19.0, river left (river right and river left are determined from the point of view of an observer looking downstream). Figure 6 -The Glade Graben, Dolores River Mile 22.0. The faults bounding the down-dropped block occur in the two gullies, and the offset is most apparent in the Wingate Sandstone which forms the lowest and thickest cliff. 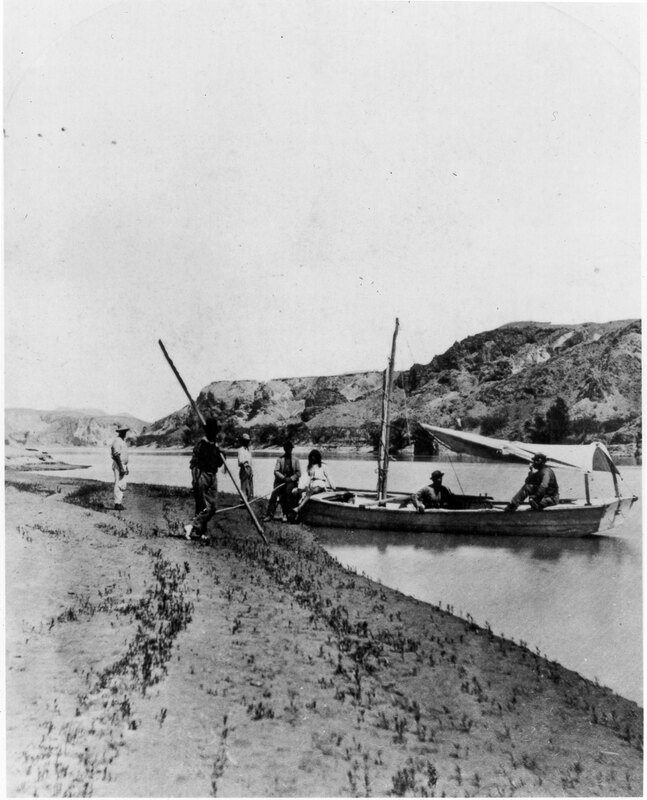 Figure 7 - Bob Gant rowing "Nicholas Needlefoot" a few miles downstream from the Dove Creek pumping station. 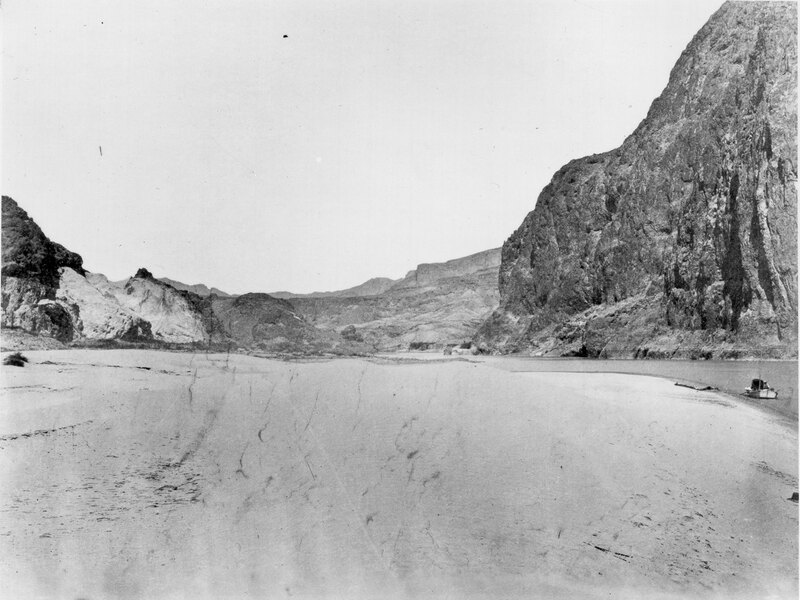 Mine access road near river, upper right. Figure 8 - "Lost Hat" Rapid. 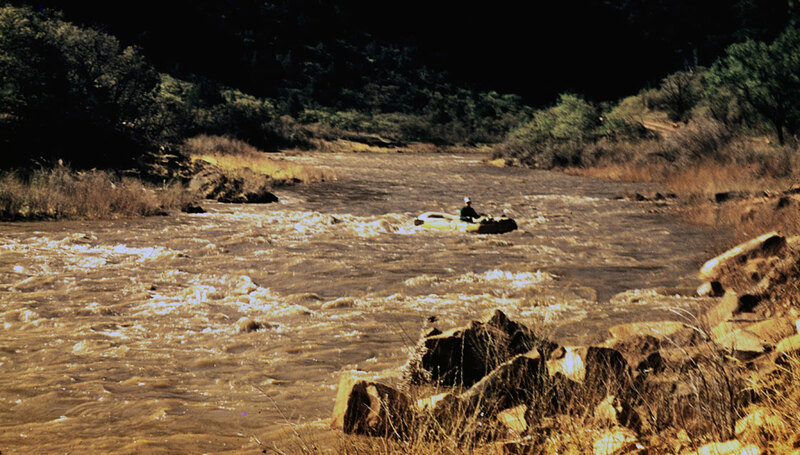 Location undetermined, possibly Little Snag Rapid of DeVries and Maurer (1993, Mile 26.4). A capricious wind whisked my hat aloft before dunking it in the chocolate of the river, a toast to the River Gods. 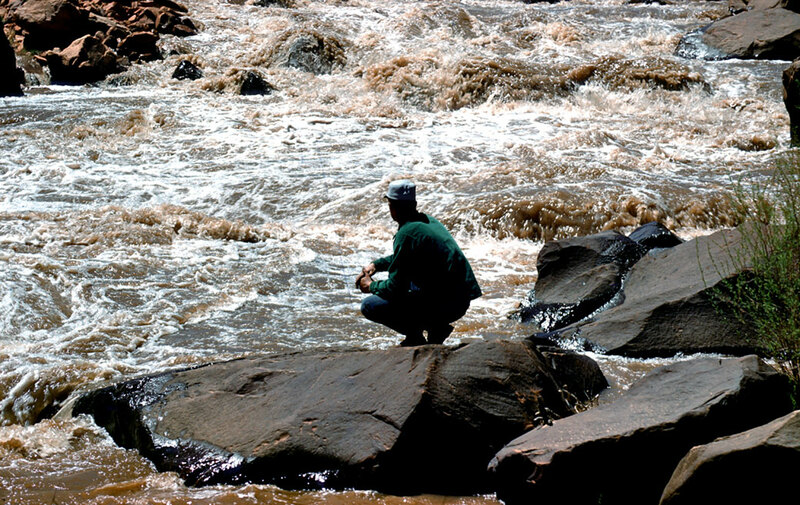 Figure 9 - Bob Gant in Nicholas Needlefoot in lower part of "Lost Hat" Rapid. 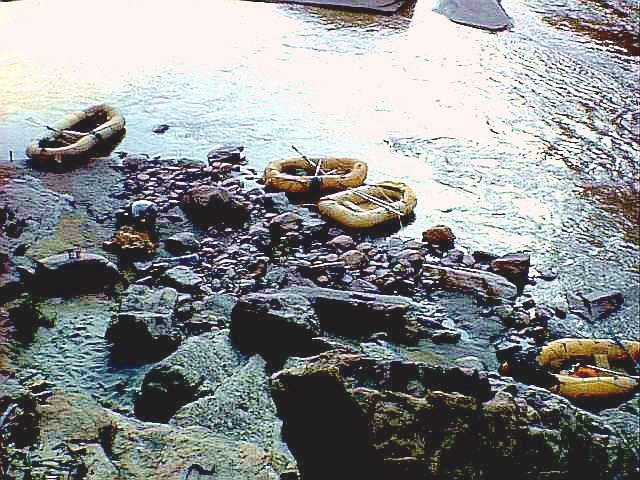 Figure 10 - We broke an oar in "Lost Hat" Rapid. Bob Gant whittled a long stick which he jammed into the two severed parts, making a firm repair. Horseshoe Bend. 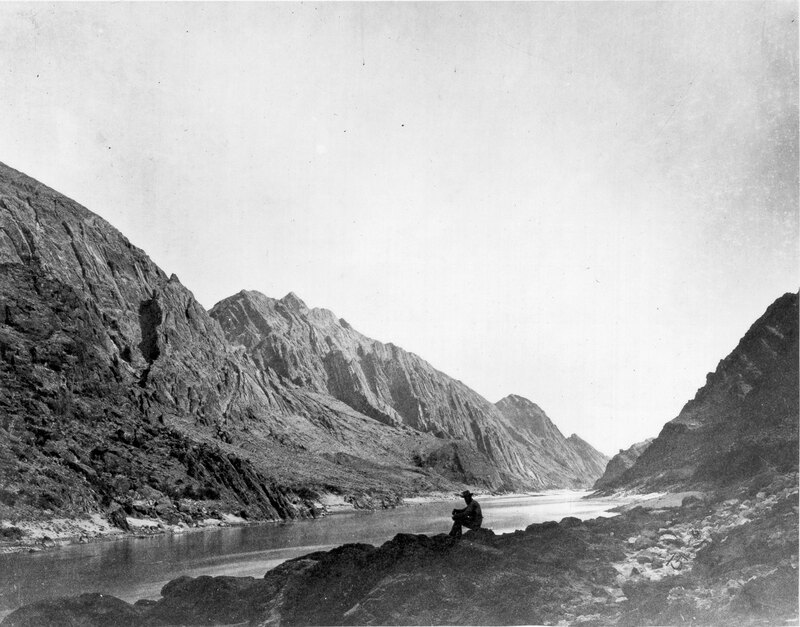 A saddle in the bend isolates a hill to the northeast which rises 300 feet above the saddle and 500 feet above the river. We dubbed this promontory the "Dolores Pyramid." 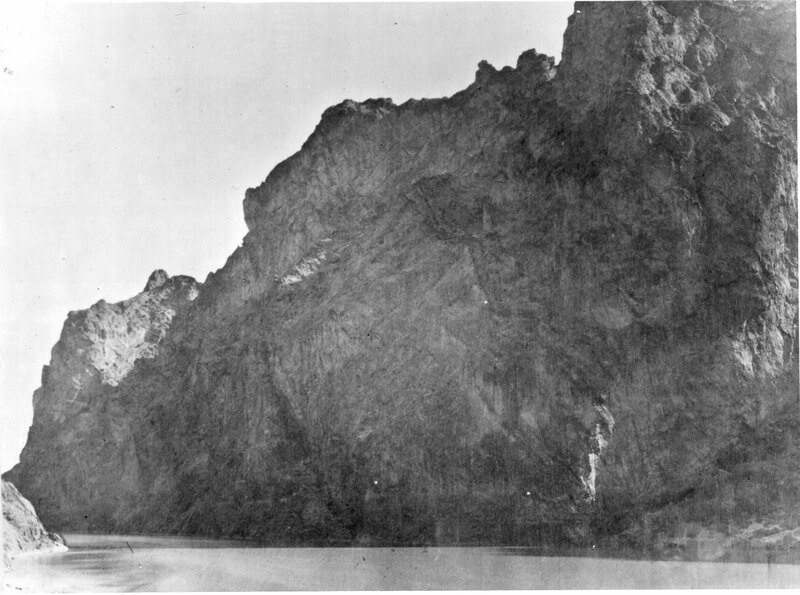 Figure 12 - Horseshoe Bend and the "Dolores Pyramid." 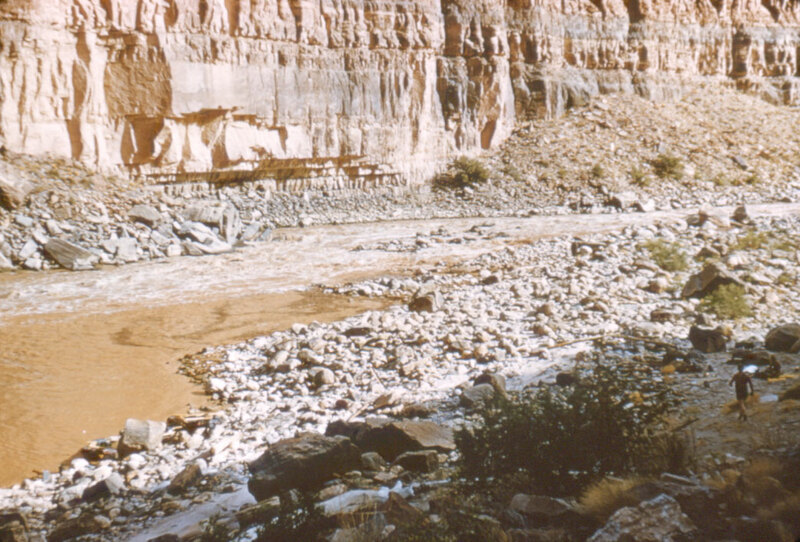 The Dolores River in flood stage, 26 May 1973; the river on the left side of the view flows toward the camera, and on the right-away and down stream. View from a mine road in the S1/2, NW1/4, Sec. 6, T. 42 N., R. 17 W. We stopped for a "break" at Mile 3 1.2 (Fig. 13), river left opposite the south end of Joe Davis Hill knowing that after a little more than a mile we would encounter practically continuous rapids for several miles until we rounded the west end of Joe Davis Hill. 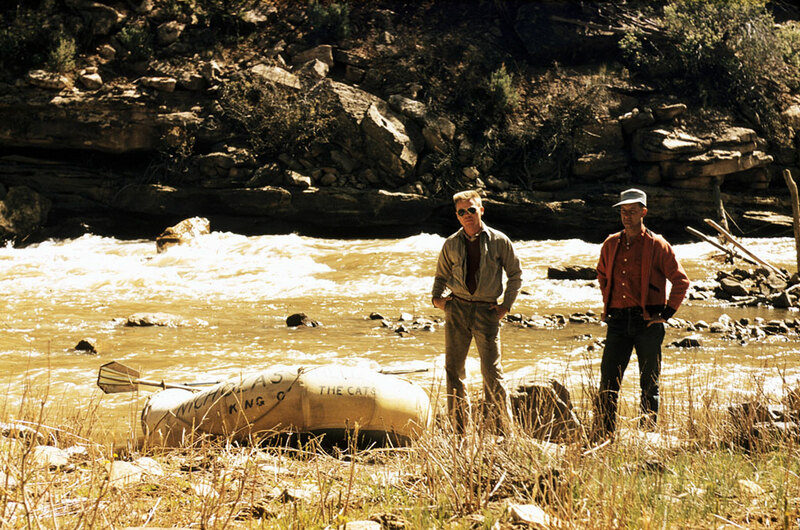 Figure 13 - Bob Gant with Nicholas Needlefoot and The Waters of Lodore at Mile 31.2. 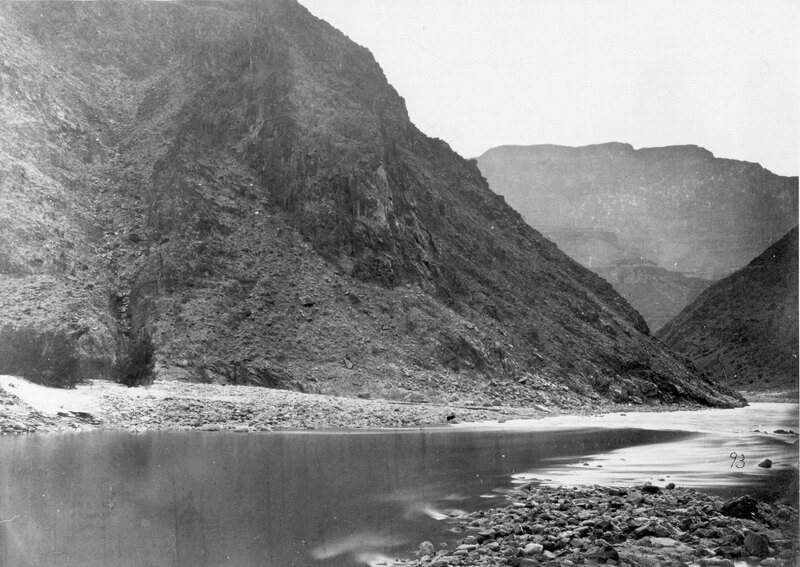 Figure 14 - George Simmons (L) and Bill Rodgers (R) in Nicholas Needlefoot at the Bradfield Bridge (Mile ON), the head of the Ponderosa Gorge. Present day launching is at the Bradfield Recreation Site, 0.6 miles downstream on river left. Figure 15 - Slab House Ruin near Bradfield Bridge. Trees are growing in the ancient rooms. 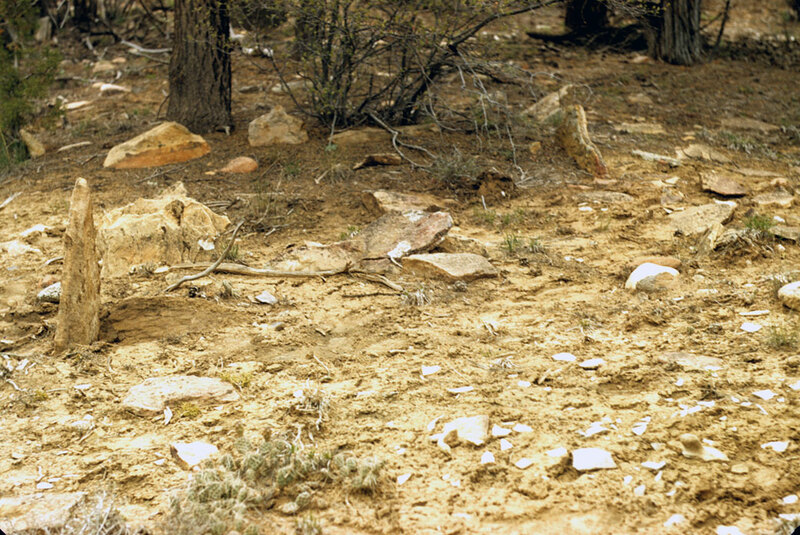 A few slabs are still standing, and the area is littered with pottery shards. Figure 16 - Bill Rogers (L) and Bob Gant (R) with Nicholas Needlefoot. 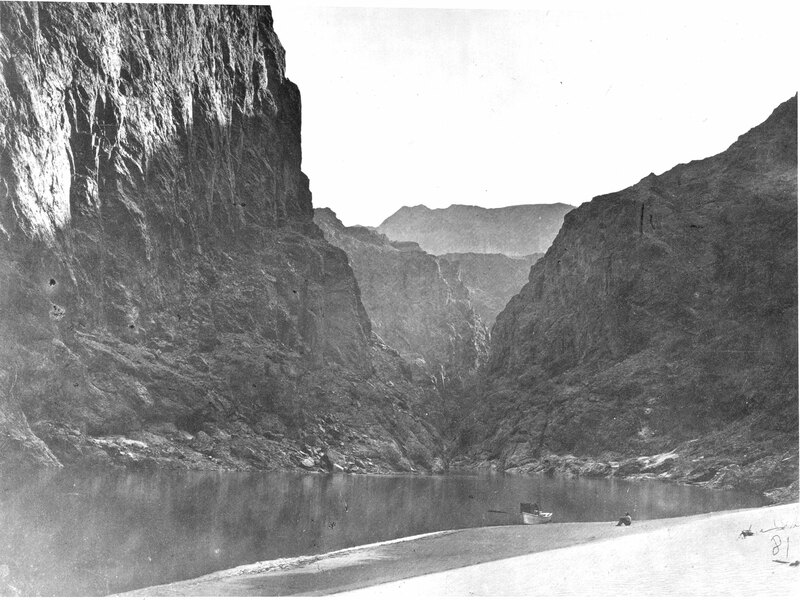 Note barbed wire fence crossing the Dolores River at upper right. 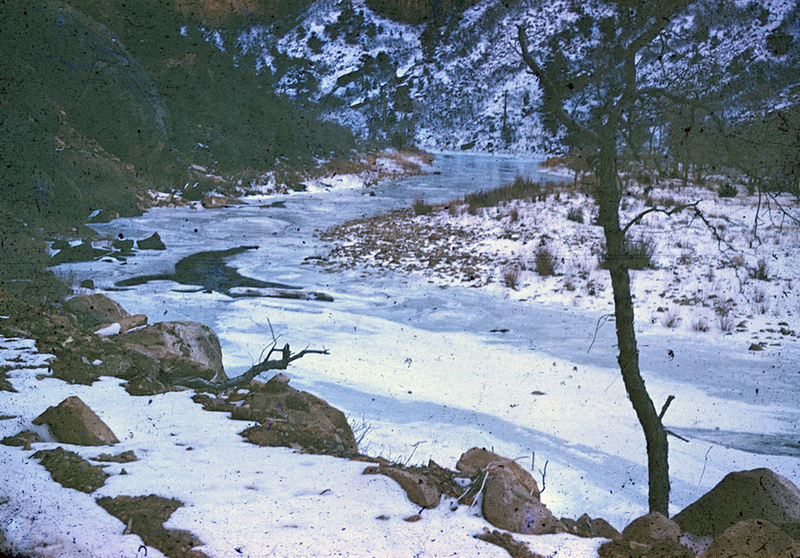 Figure 18 - A pine tree lies completely across the DOlores River in Ponderosa Canyon. Bill Rogers rows Nicholas Needlefoot to the portage point by the tree's roots. Fiqure 19 - Bob Gant (L) and Bill Rogers (R) portage Nicholas Needlefoot around Ponderosa. 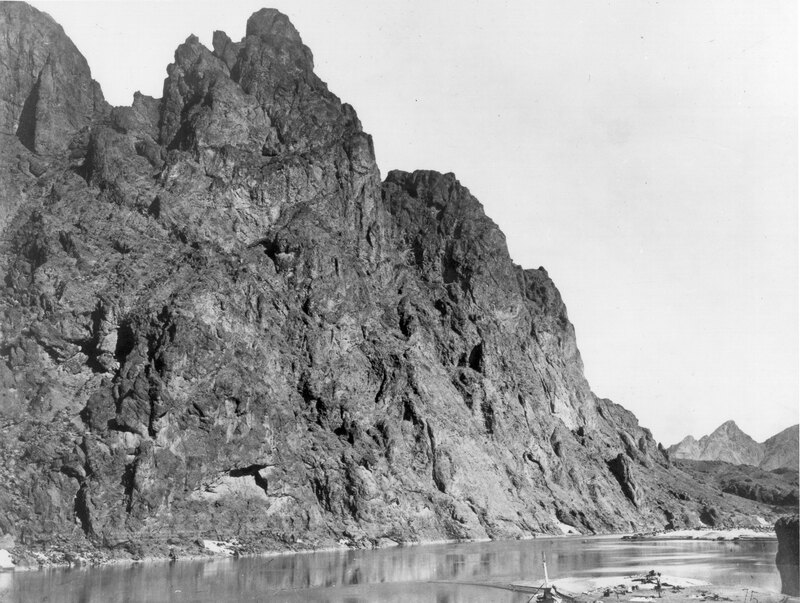 In February of 1956, George Simmons begins correspondence with the then-active river community to inquire about possible assistance to complete a mapping project in Cataract Canyon. The lead for this project is Richard Lewis of the US Geological Survey from Denver, Colorado. Simmons, also an USGS employee, is on field assignment to investigate uranium deposts in the Canyonlands region of the Colorado Plateau; at the time he is stationed at Slickrock, Colorado, which is next to the Dolores River and in the heart of the Uravan Mineral Belt. 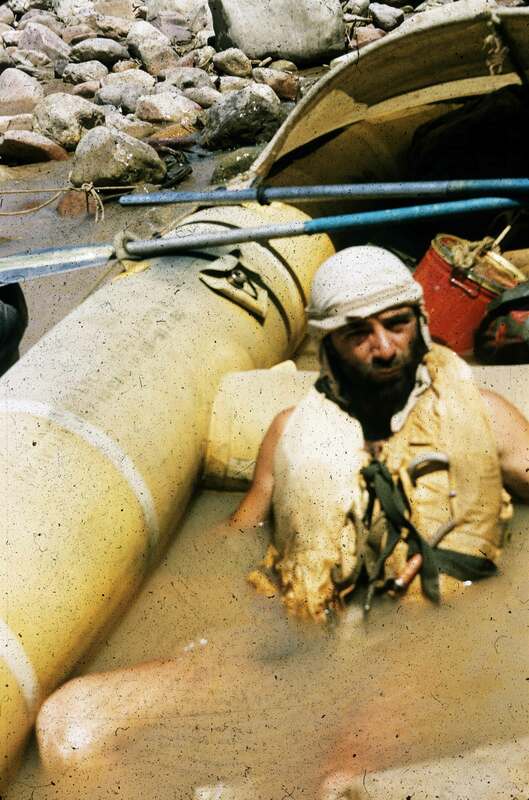 Black George (his nickname at the time was Sim) sends his inquiries to both commercial and private river runners. 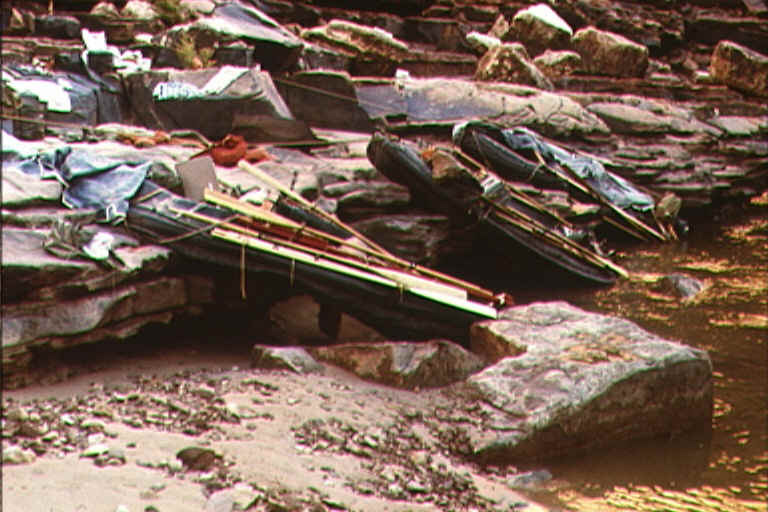 For example, he writes to Californians such as Pat ReilIy, Georgie White and Otis Marston; Utahns such as Harry Aleson, Bus Hatch, Don Harris and A. K. Reynolds; and Moulty Fulmer from Muncie, Indiana, who built his own whitewater dory and introduced the craft to the Grand Canyon in 1955. 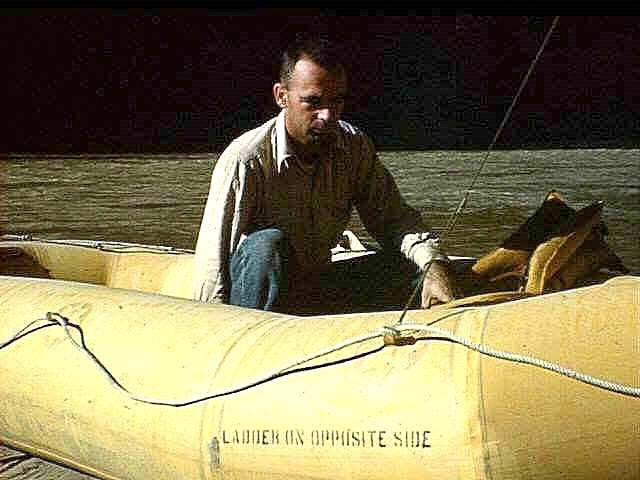 Lewis decides it would be less expensive to let the USGS employees do the trip themselves using their own equipment, and with Simmons serving as the lead boatman. 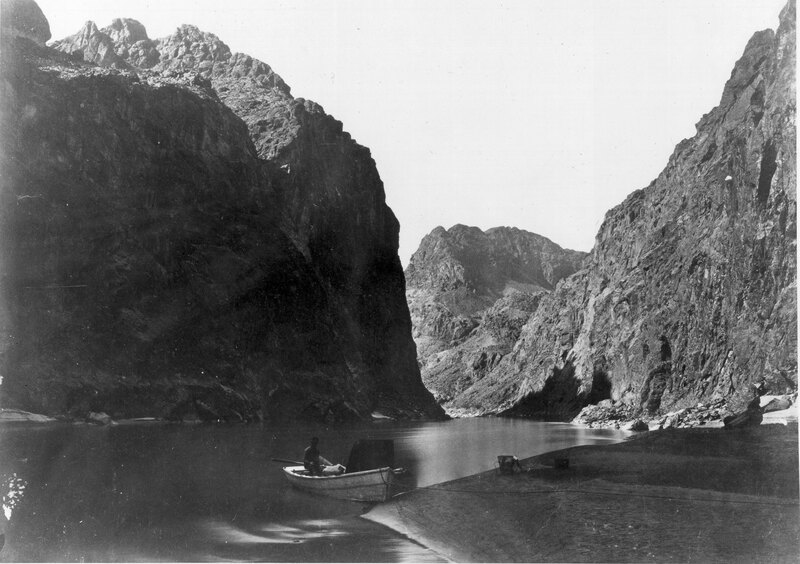 By this time Simmons had completed many river trips, including a previous run through Cataract Canyon in 1952, Lodore Canyon in 1954, and Grand Canyon in 1955. 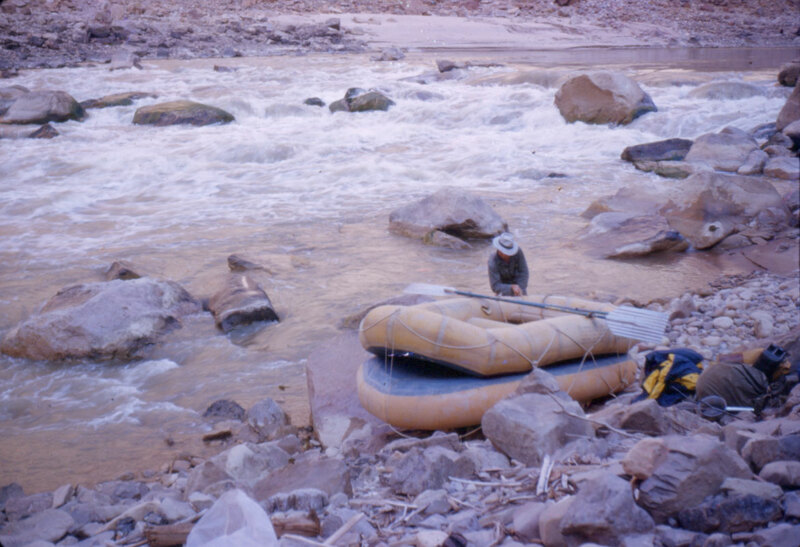 Big Drop 3 (1952 trip) - Dave Arnold lashes boats together after we monstered (loaded with water, but did not flip) at Big Drop III. 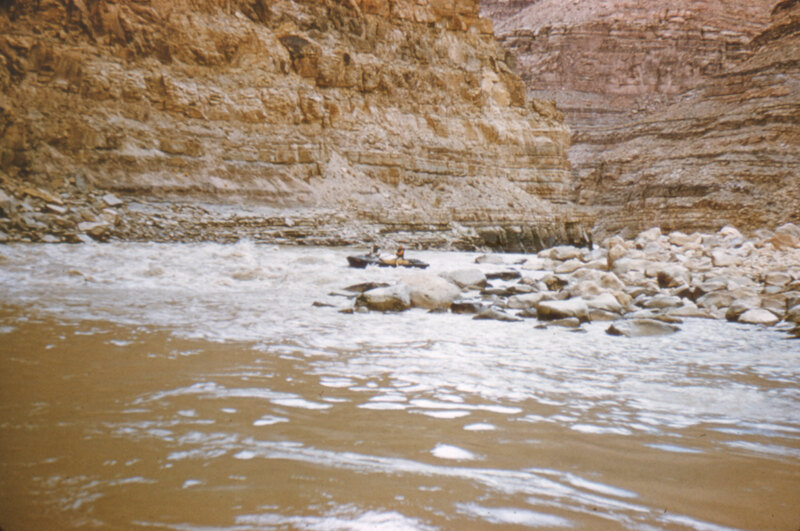 1969 - River Runner's Guide to Marble and Grand Canyons with Emphasis on Geologic Features. George Simmons and Dave Gaskill. 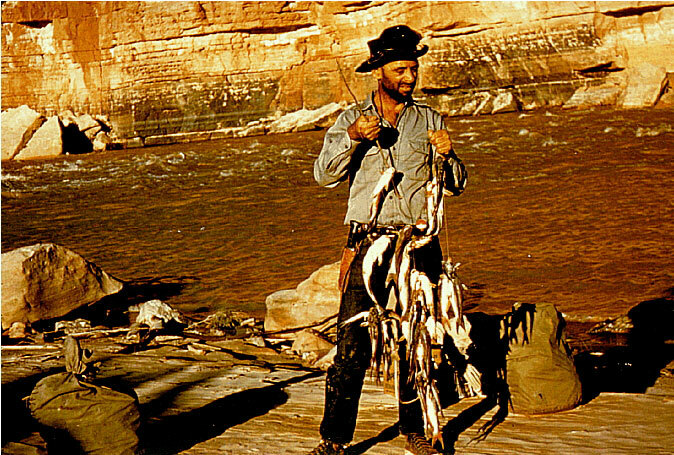 1955, July 6 - Sim (Black George) with his and Parky Brook's catch of catfish at Lee's Ferry while awaiting the shipment of a boat from Harry Aleson. 06 July 1955. 1955, July 12 - Mile 29.5, river left. 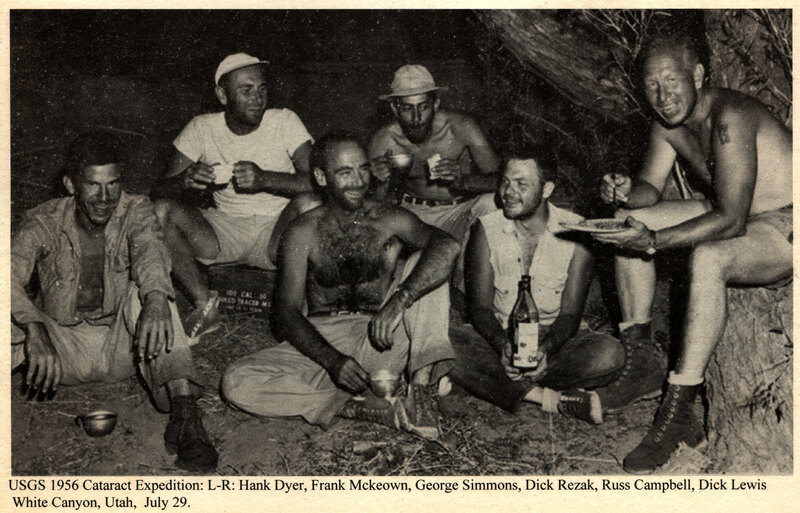 Four members of the Western Speological Institute Expedition shade at a lunch stop during another 120+ day. 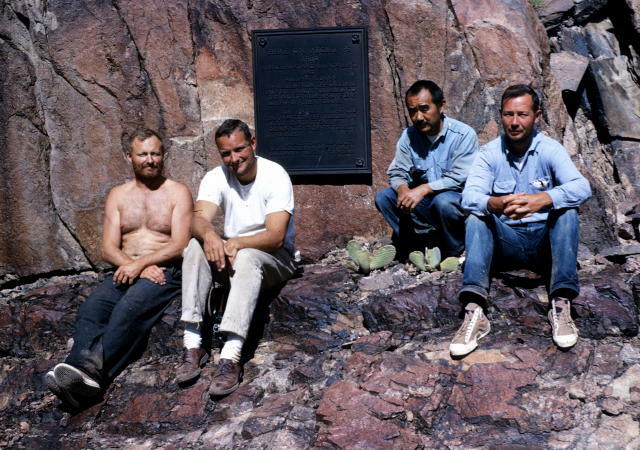 Left to right Dave Gaskill, Art Lange, Parky Brooks, and Raymond de Saussure. 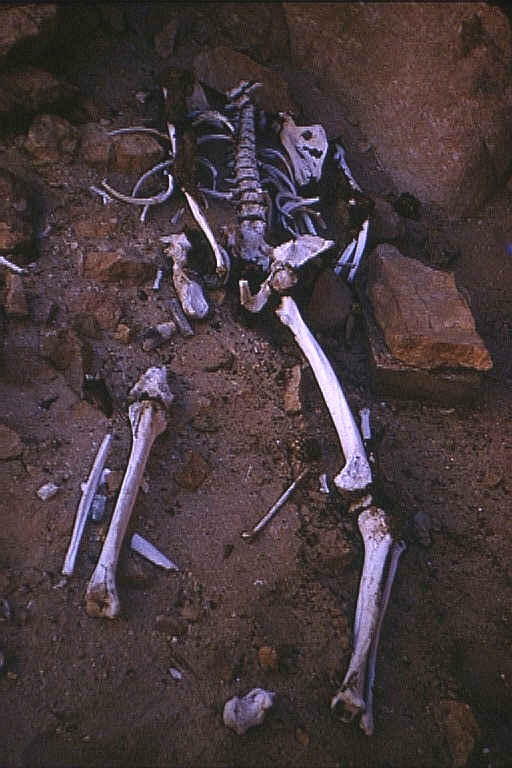 1955, July 12 - Skeleton in front of cave at Mile 31.5, river right, Western Speoleogical Institute Expedition. I have seen pictures from earlier trips in whicn the skull was present. 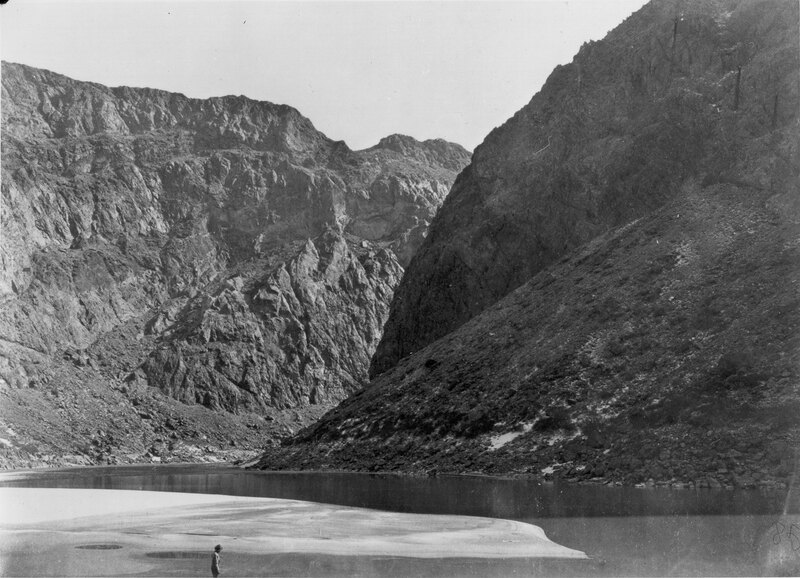 1955, July 13 - Camp at Vasey's Paradise, Mile32, river right, 07:00. 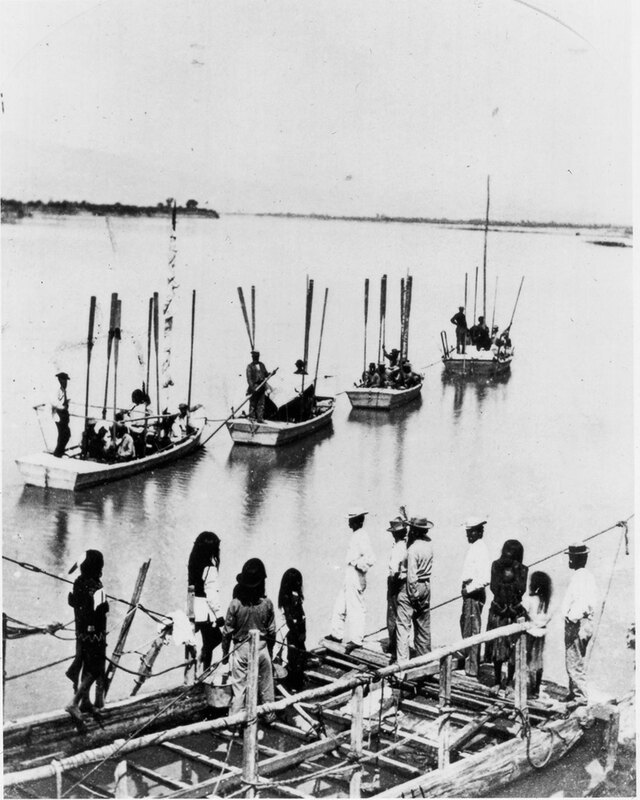 Western Speological Institute Expedition. 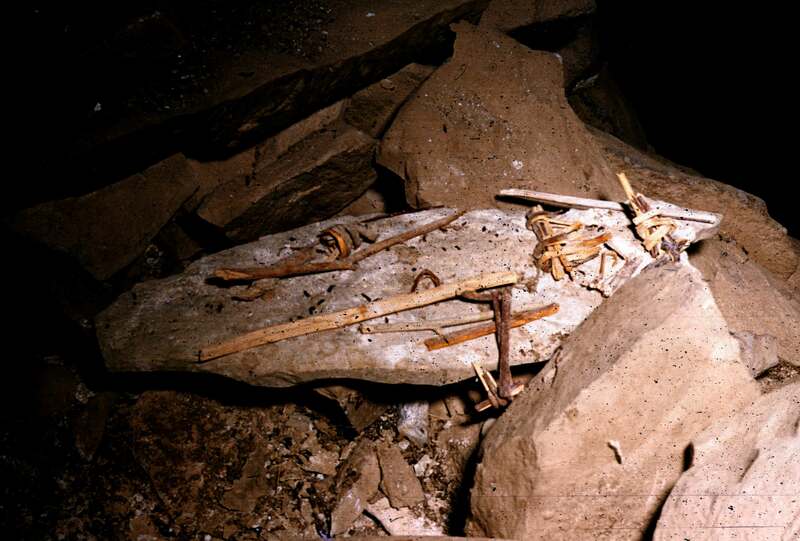 1955, July 13 - Twig Figurines removed by WSI from the upper level of Stanton's Cave, Mile 31.5, river right. 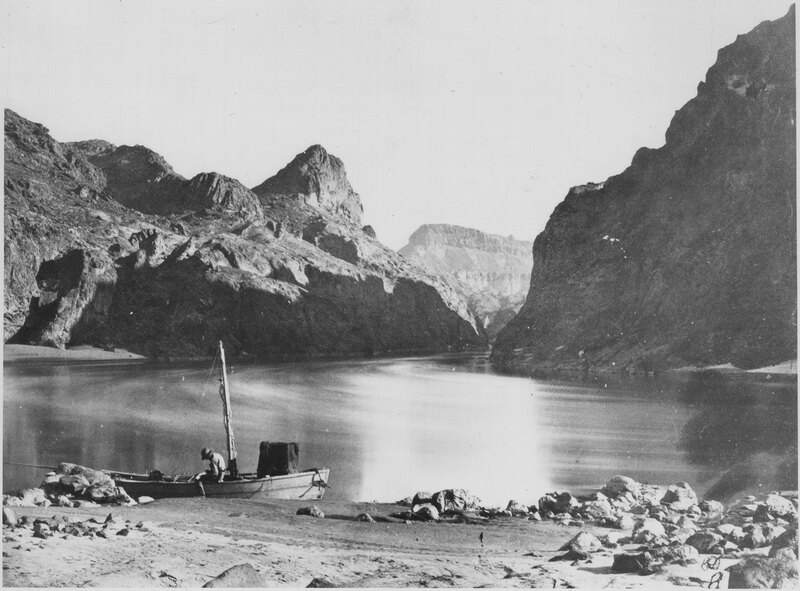 1955, July 14 - Bert Loper's boat at Mile 41,river right. 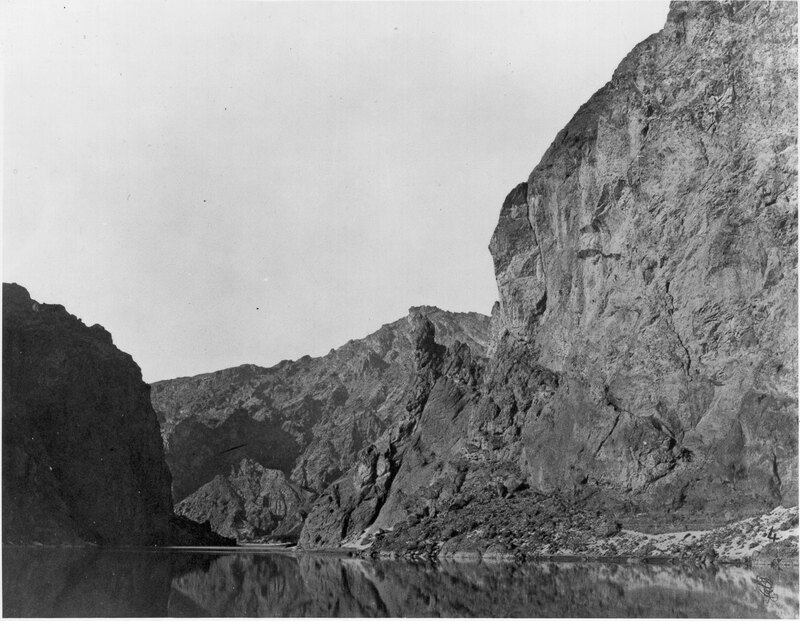 1955, July 14 - Bob Swift (President of the Rock Climbing Section of the Sierra Club, hired to assist WSI speoleologists gain access to caves) silhouetted against wall of Marble Canyon. 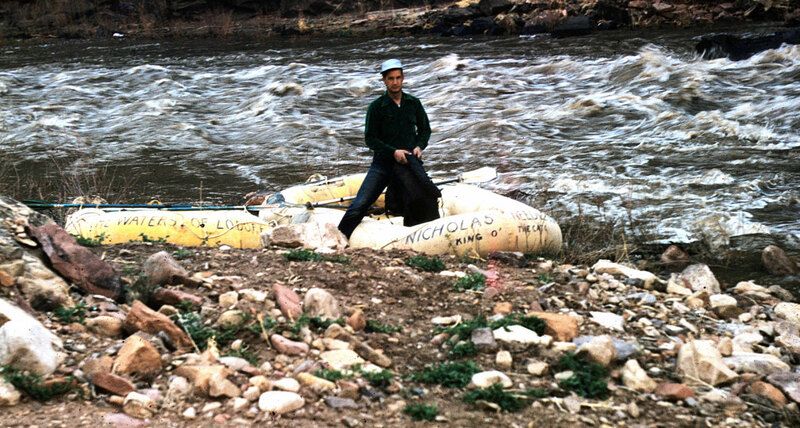 1955, July 15 - George Simmons and Parky Brooks hauled Simmons' boat, Nicholas Needlefoot (King of the Cats) up the Little Colorado River for pictures. Sim (Black George) in Needlefoot. 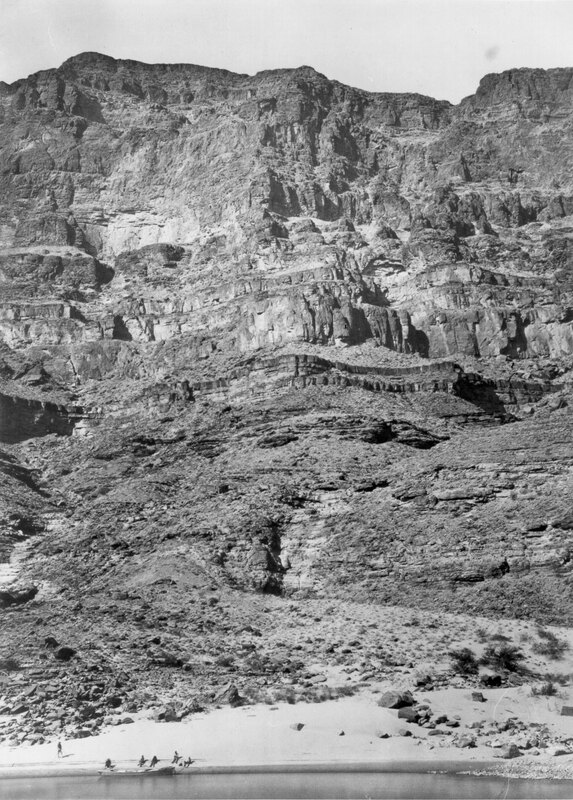 1970, November 19 - Canyon of the Little Colorado River from the upper part of the Hopi Canyon Salt Trail. 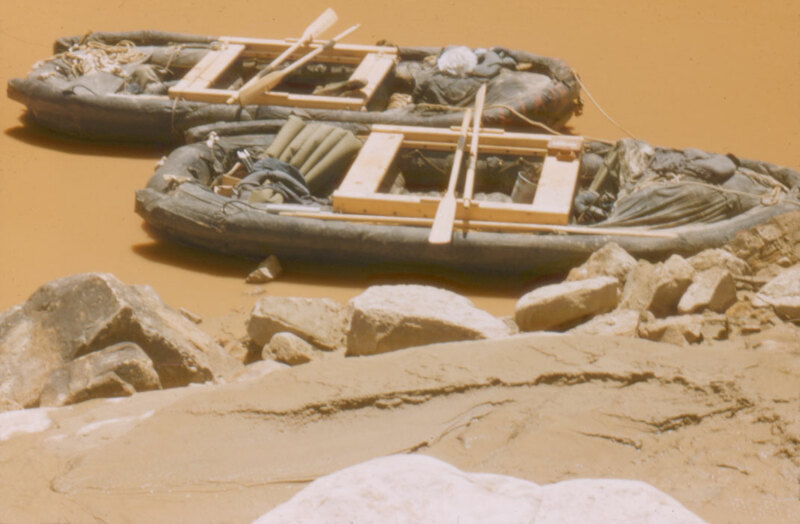 1955, July 18 - Sim (Black George) swamped in a hole at the bottom of Unkar Rapid. Mile 72 3/4, river right (Photograph by Bob Swift). 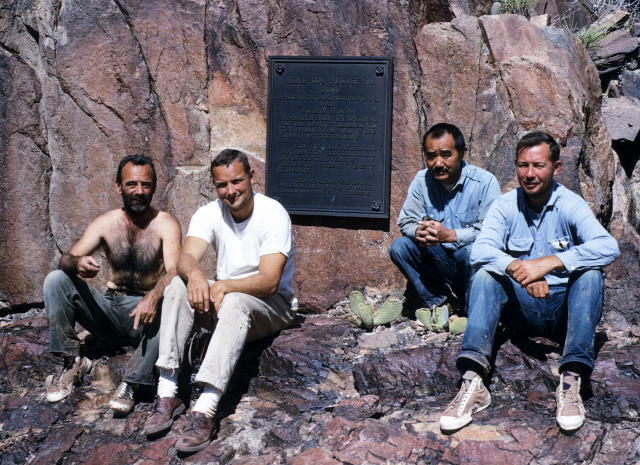 1967, October 09 - Powell Society at Separation Rapid. . (Left to right): Hank Toll (Dr. Henry W., Jr.), President; Dr. David L.Claassen; Dr. George I. Ogura, Vice President; Knobby Newmann. 1967, October 09 - Powell Society at Separation Rapid. (Left to right): Sim (Black George Simmons) Trustee; Dr .David L. Claassen; Dr. George I. Ogura, Vice President; Knobby Newmann. 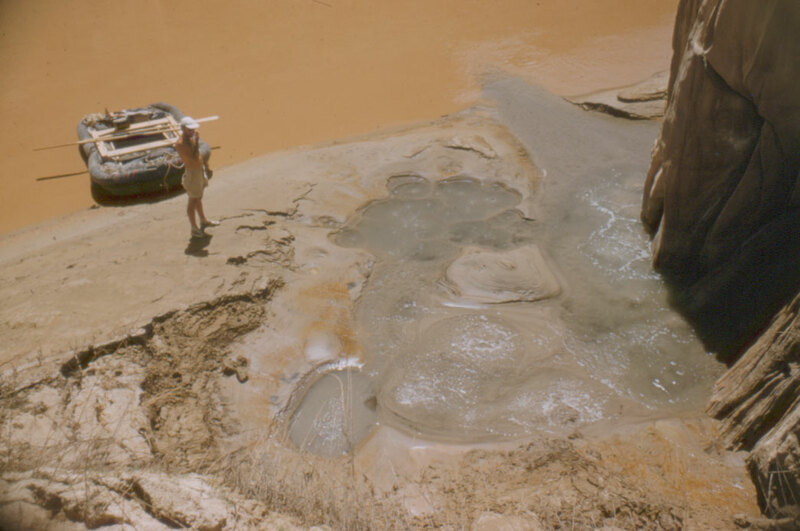 1972, May 11 - Mooney Falls. 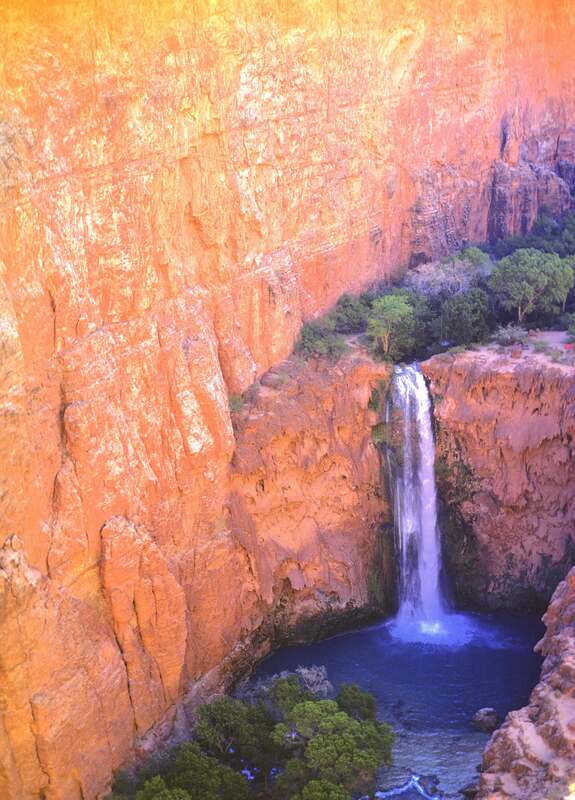 Havasu Canyon. 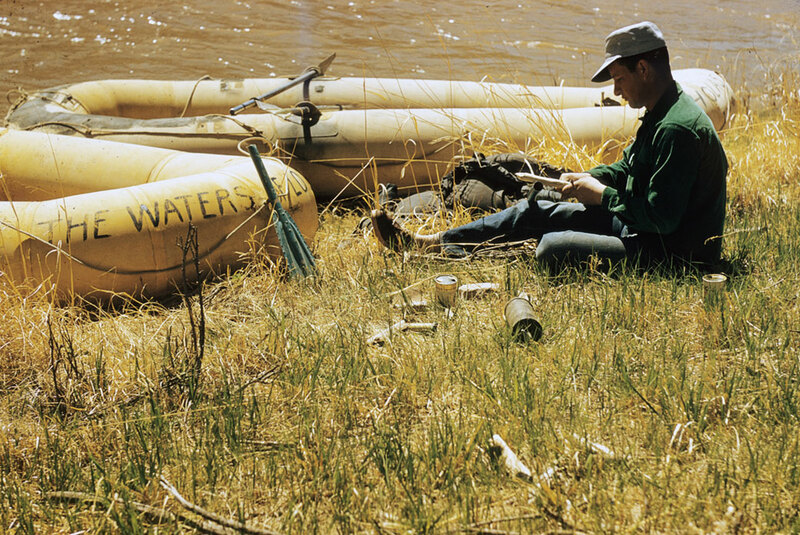 1951, September 3 - Yampa River. Gudy Gaskill (left) rowing; Helen Hartel (right) in bow. 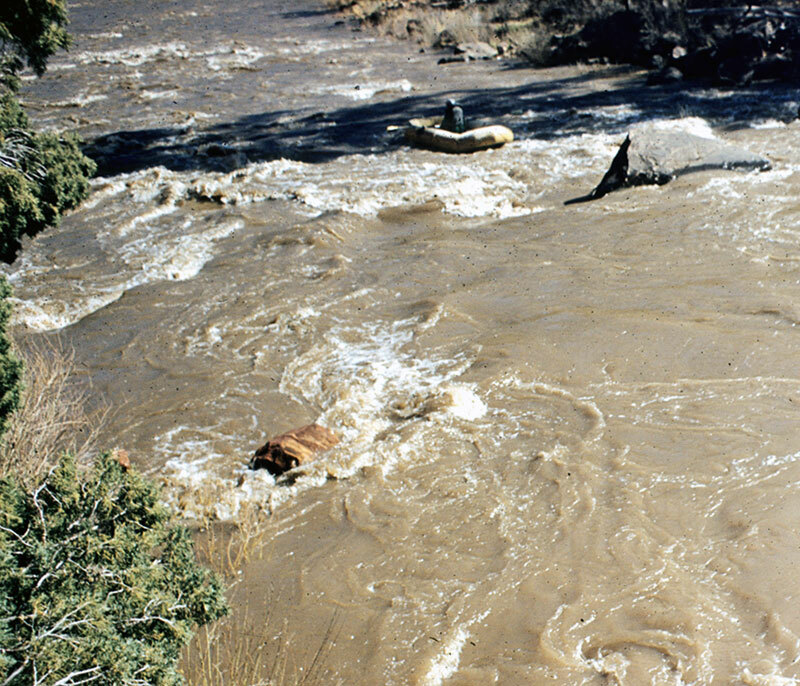 A treacherous rapid was formed here by a flashflood down Warm Springs Creek on the night of 10 October 1956. 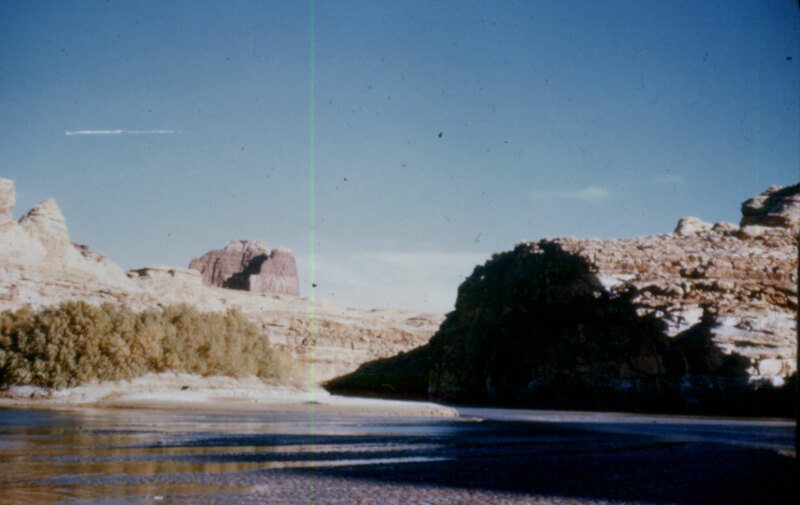 1952, May 28 - Green River. Sim (Black George) ready to embark from 1st camp in upper part of Red Canyon. 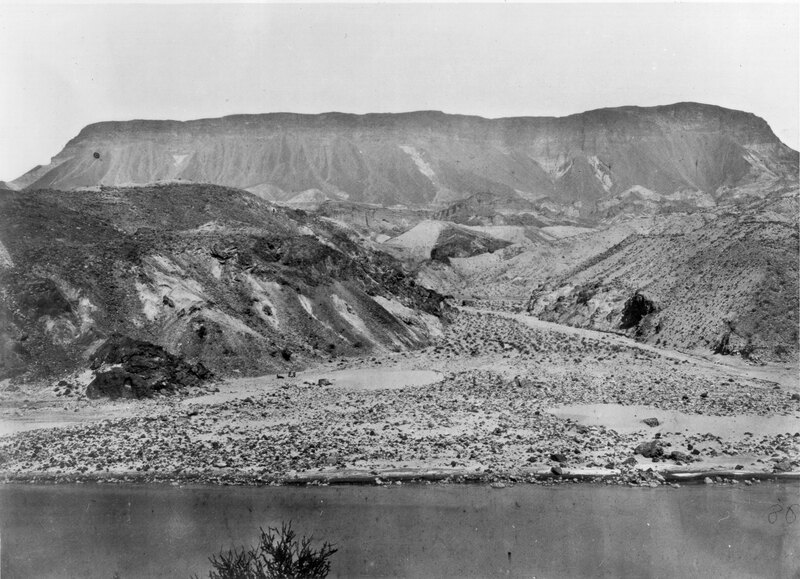 1952, May 28 - Green River. 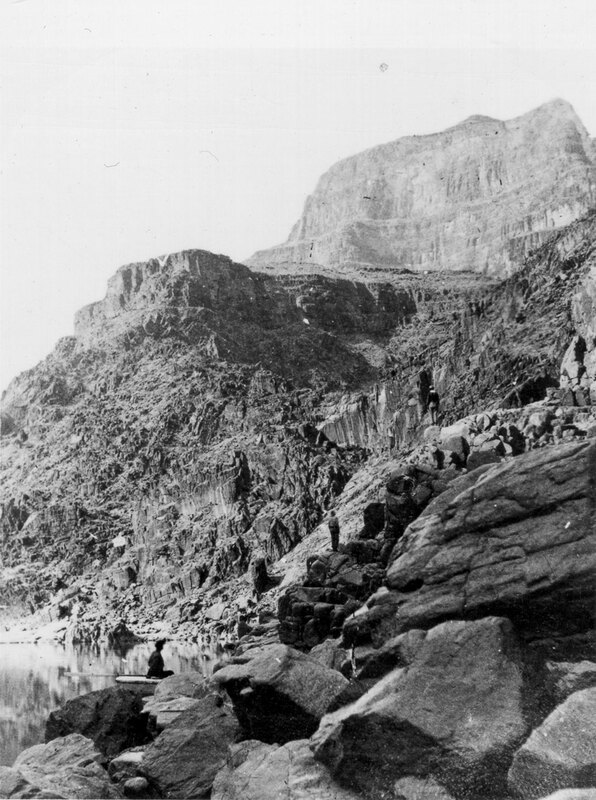 Ashley Falls which is now about 370 feet below the surface of Flaming Gorge Reservoir. 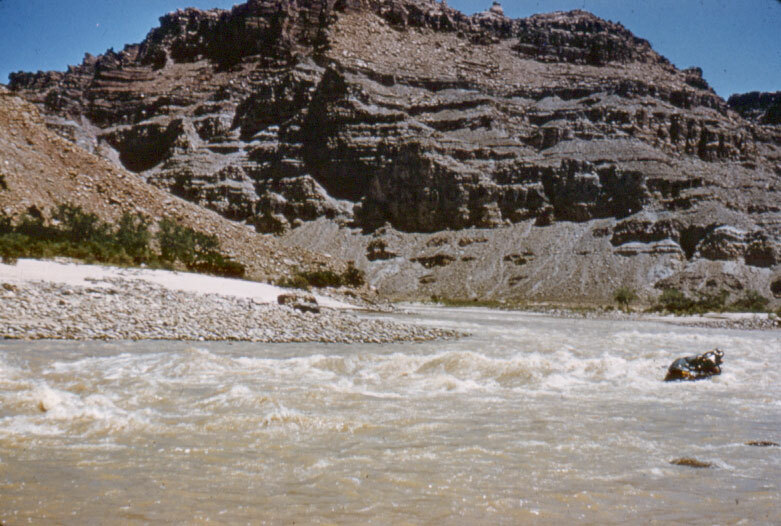 1953, June 19 - San Juan River. 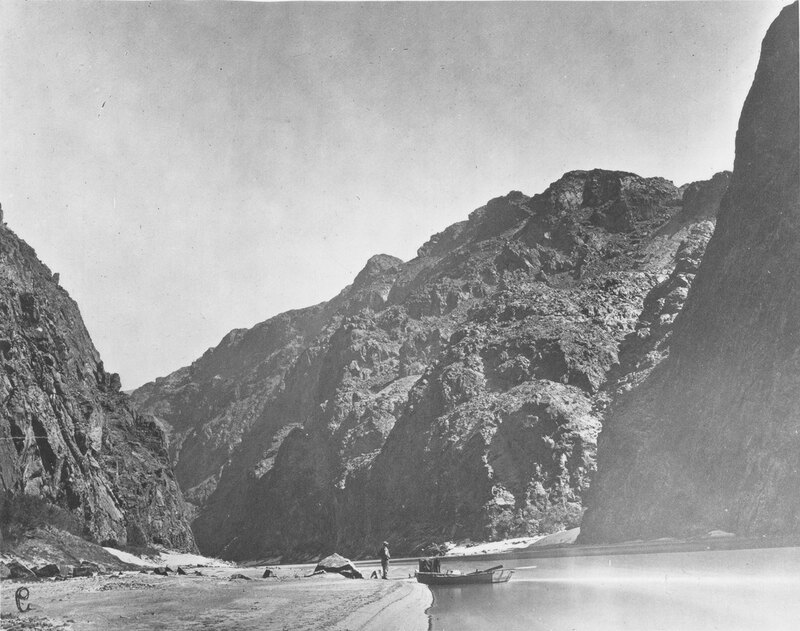 The landing at the mouth of Grand Gulch, Mile 71, river right. 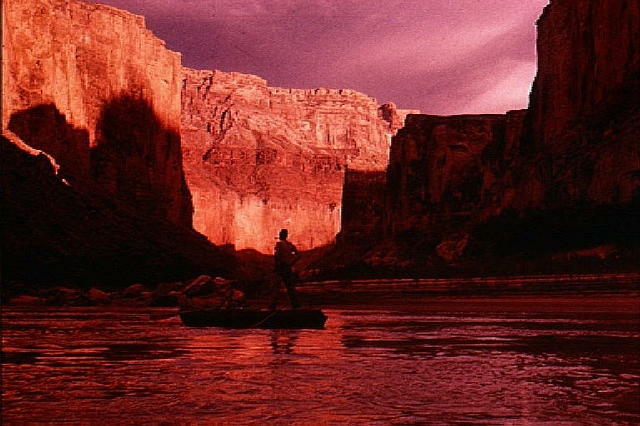 1957 - Georgie White-Clark: River Trip in Canyonlands. Desert Magazine. 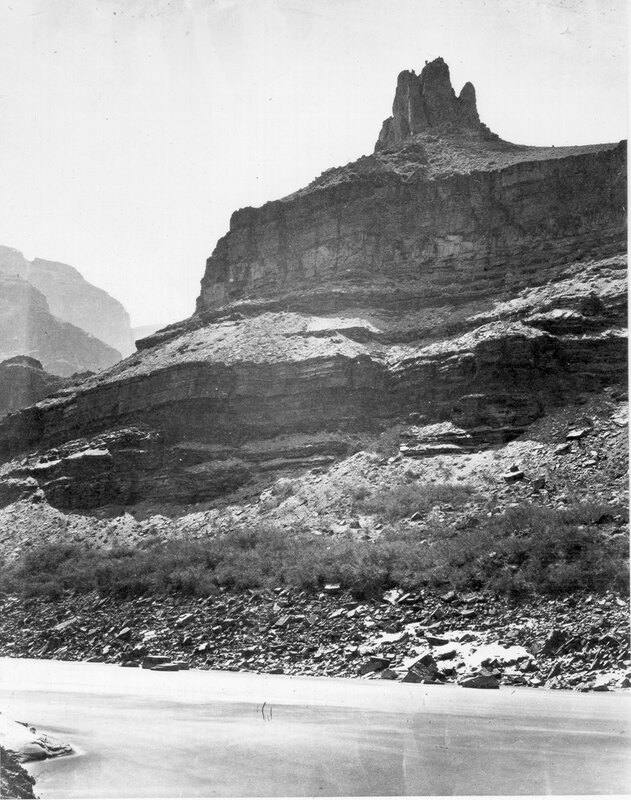 1958 - Flying The Colorado RIver. Arizona Highways. 1966 - David Brower: Knight Errant to Nature's Rescue. Life Magazine. 1966 - Charlie Eggert & Sid Rickets Sumners. Event Promotional Materials. 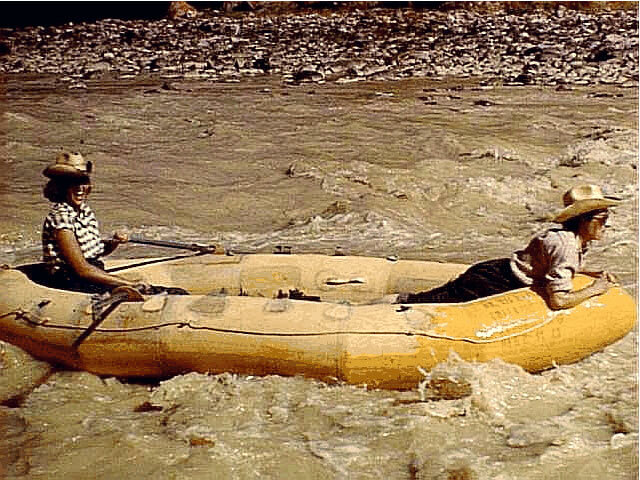 1967 - Running Rapids, Vintage 1842 (Fremont Expedition). Hart. 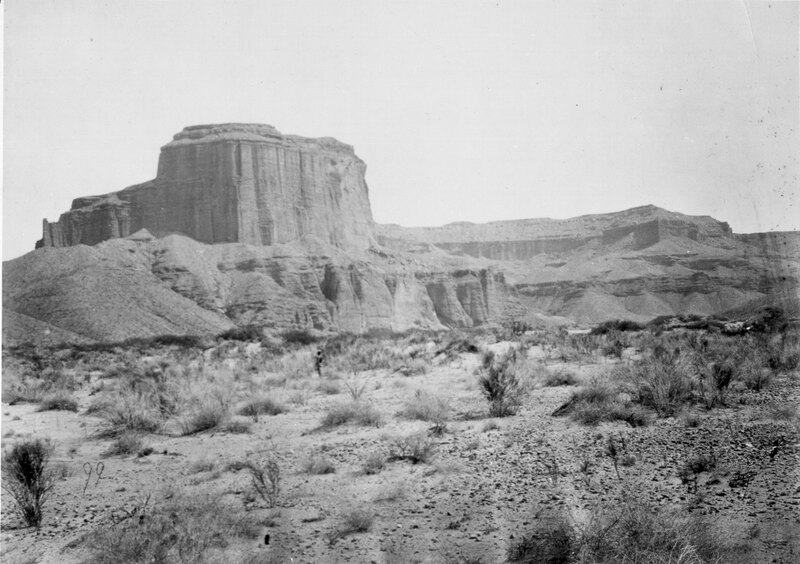 1969 - JWP Centennial: Canyonlands, Part One. Denver Post Magazine. 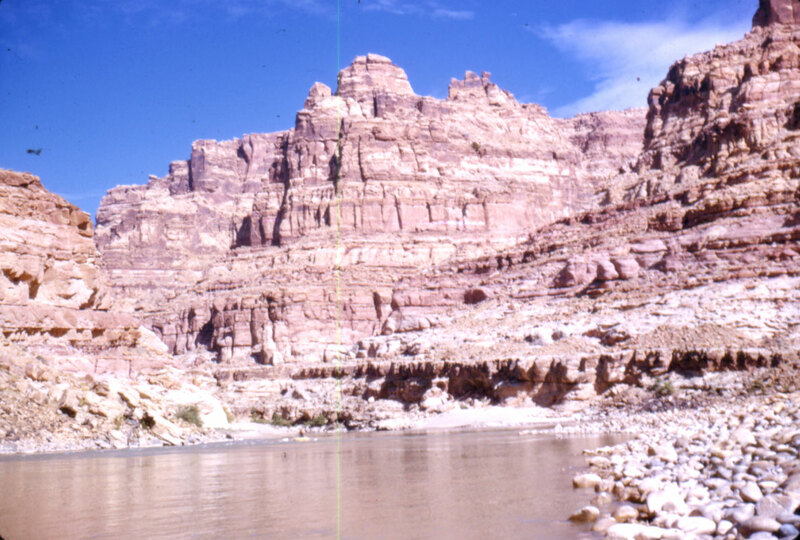 1969 - JWP Centennial: Canyonlands, Part Two. Denver Post Magazine. 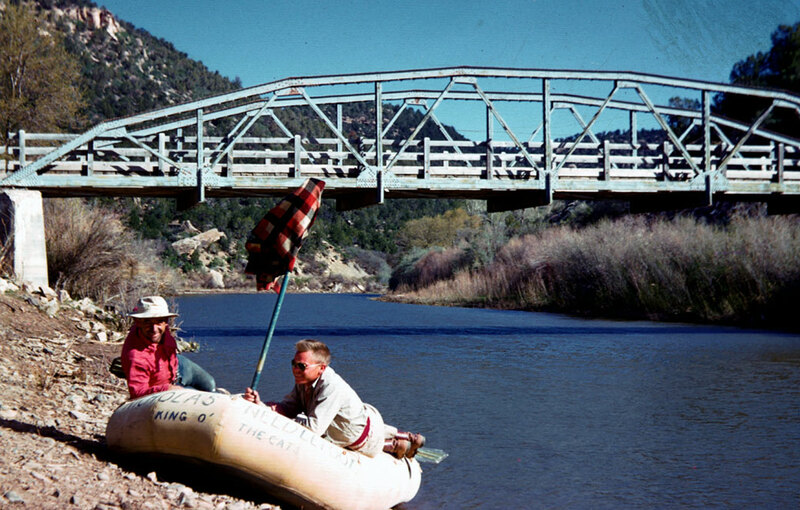 1969 - JWP Centennial: Adventure on the Colorado River. Redbook Magazine. 1969 - JWP Centennial Issue. Reclamation Era. 1969 - JWP Centennial: Art Venue Materials. 1969 - JWP Centennial: Letter Head. Powell Society. 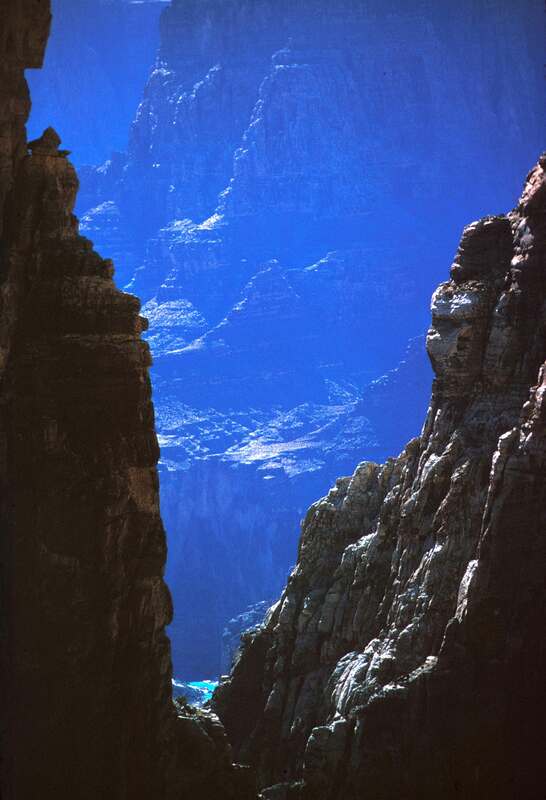 1969 - JWP Centennial: Havasupai: Misery In Shangrila. Denver Post Magazine. 1969 - JWP Centennial: Photo Guidebook To Lake Powell. Sun Publishing. 1969 - JWP Centennial: Powell's Quest. American Forests. 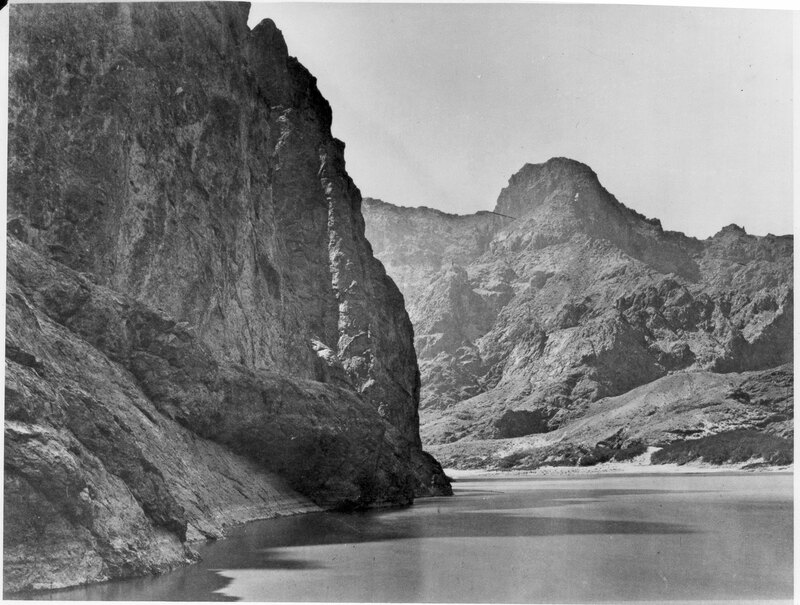 1969 - JWP Centennial: Roaring Down the Colorado River. Chicago Tribune Magazine. 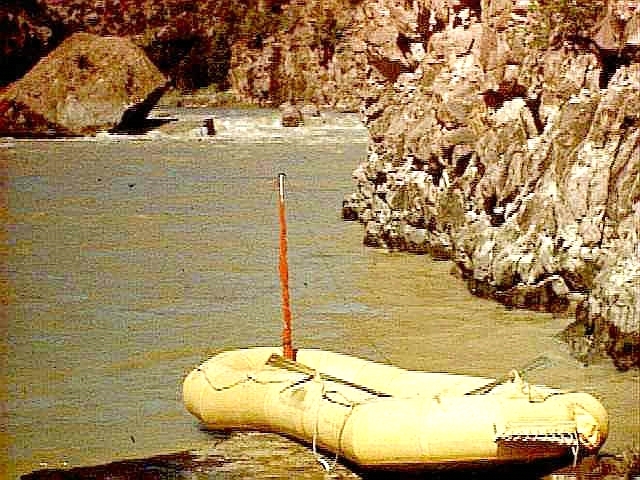 1969 - JWP Centennial: The Wildest Boat Trip in the World. Popular Mechanics. 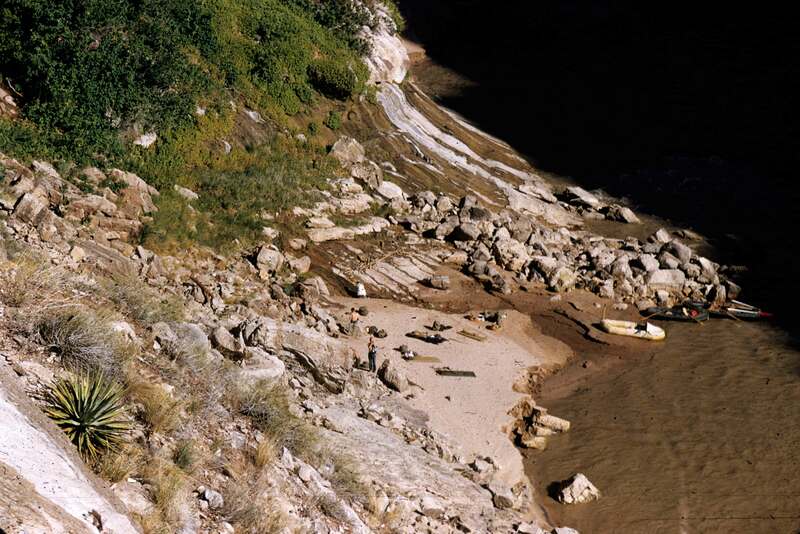 1971 - Rim Rock Hopping: Utah's Bowdie Canyon. Wilderness Camping. 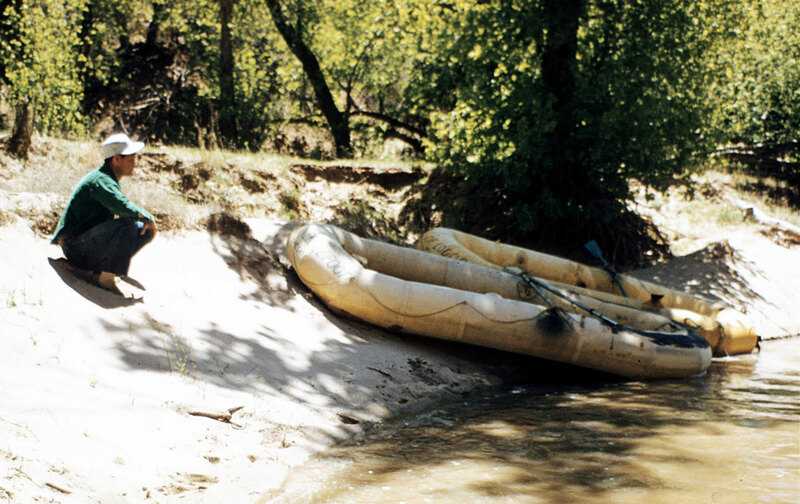 1974 - Wooden Boats Plus Colorado Rapids Equals Adventure. Smithsonian.